A jury is a body of lay men and women randomly selected to determine facts and to provide a decision in a legal proceeding. Such a body traditionally consists of 12 people and is called a petit jury or trial jury. The exact origin of the jury system is not known; various sources have attributed it to different European peoples who at an early period developed similar methods of triaL The jury is probably of Prankish origin, beginning with inquisition, which had an accusatory and interrogatory function. Trial by jury was brought to England by the Normans in 1066. In medieval Europe, trials were usually decided by ordeals, in which it was believed God intervened, revealing the wrongdoer and upholding the righteous. In the ordeal by water, for instance, a priest admonished the water not to accept a liar. The person whose oath was being tested was then thrown in. If he floated, his oath was deemed to have been perjured. If he was telling the truth, he might drown but his innocence was clear. In 1215, however, the Catholic Church decided that trial by ordeal was superstition, and priests were forbidden to take part. As a result, a new method of trial was needed, and the jury system emerged. At first the jury was made up of local people who could be expected to know the defendant A jury was convened only to "say the truth" on the basis of its knowledge of local affairs, The word verdict reflects this early function; the Latin word from which it is derived, veredictum, means "truly said". In the 14Th century the role of the jury finally became that of judgment of evidence. By the 15th century trial by jury became the dominant mode of resolving a legal issue. It was not until centuries later that the jury assumed its modern role of deciding facts on the sole basis of what is heard in court. e a belief or practice resulting from ignorance, fear of the unknown, trust in magic or chance. 1. What is a jury? 2. How were cases resolved before jury system emerged? 3. Why was there a need for jury system? 4. What was the function of the first juries? 5. How did the function of the jury change through the centuries? The ordeal by physical test, particularly by fire or water, is the most common. In Hindu codes a wife may be required to pass through fire to prove her fidelity to a jealous husband; traces of burning would be regarded as proof of guilt. 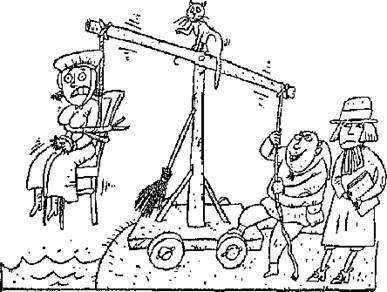 The practice of dunking suspected witches was based on the notion that water, as the medium of baptism, would 'accept', or receive, the innocent and 'reject1 the guilty. Court officials would tie the woman's feet and hands together and then drop her into some deep water If she went straight to the bottom and drowned, it was a sure sign that she wasn't a witch. On the other hand, if she didn't sink and just bobbed around for a while, the law said she was to he condemned as a witch. 'judgement of God' was thought to determine the winner. If still alive after the combat, the loser might be hanged or burned for a criminal offence or have a hand cut off and property confiscated in civil actions. 1. What was the purpose of ordeal In early ages? 2. What were the main types of ordeals? 3. What did ordeal by divination consist of? 4. What did ordeal by fire have to prove? 5. In what way was ordeal by water devised? 6. 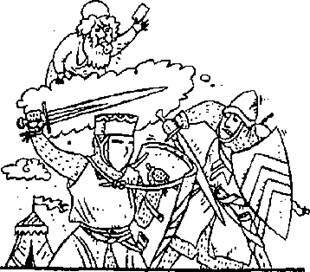 What concept was at the basis of ordeal by combat? 2. To consult) entertain, employ, feed, or reward any evil Spirit, to or for any intent or purpose, is Feiony in such offenders, their aiders and counsellors. 3. To take up any dead body, or any part thereof, to be employed or used in any manner of Witchcraft, is Felony in such offenders, their aiders and counsellors. 4. Also to use or practice Witchcrafts, Enchantment, Charm, or Sorcery, whereby any person shall be killed, pinned, or lamed in any part of their body, or to be counselling or aiding thereto, is Felony. By the ancient common law such offenders were to be burned. Now against these Witches, (being the most cruel, revengeful, and bloody of all the rest) the Justices of Peace may not always expect direct evidence, seeing all their works are the works of darkness, and no witnesses present with them to accuse them. II, If the dead body bleeds upon the Witches touching it. 14. Their own voluntary Confession (which exceeds all other evidence), of the hurt they have done, or of the giving of their souls to the Devil, and of the Spirits which they have, how many, how they call them, and how they came by them. For Americans, serving jury duty has always been a dreaded chore. There is plenty of history behind this fear. In colonial days, jurors were locked in a small room with no ventilation and were denied food and water in an attempt to inspire a quick verdict. If the jurors returned with the wrong decisions, they too were charged with a crime. As more and more laws were passed, the rules of evidence expanded and trials became longer, which resulted in more technical and increasingly boring hours for jurors. Trial lawyers have tried to change the boredom by replacing endless hours of testimony with computer animation, video reconstructions, color charts and graphics to better explain the evidence. The judicial system depends on juries. The United States Constitution guarantees its citizens the right to a trial by jury of their peers. When summoned for jury duty, Americans should look upon it as an opportunity to serve their country, their community, and their fellow citizens. 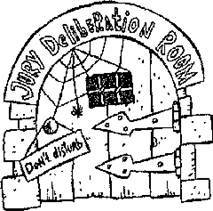 Each year, over 5 million Americans are summoned for jury duty to render verdicts in approximately 120,000 trials. 1. Why have Americans always feared the jury service? 2. In what conditions were jurors kept in colonial days? Why? 3. How has trial procedure changed through the years? 4. Why is the right to a jury trial considered to be so important for the U.S. citizens? The following text comes from a handbook on jury service for £/ie U.S. citizens. Many jurors find that it is exciting to learn about this most important system 'from the inside1, and challenging to deal fairly and thoroughly with the cases they hear. We hope that you, too, find your experience as a juror to be interesting and satisfying.